As an entertainer, he's a man of many alter egos. The versatile impersonator can also sound uncannily like Louis Armstrong, Dean Martin, Garth Brooks, John Lennon and Mick Jagger and many others. In Europe he's a name artist in his own right in the rockabilly revival scene. He an entertainer and a singer, and entertaining a room is what he does best. Over many years of experience, Vallis has learnt it's important to cater the show to the audience and give them what they want putting the crowd at ease with a comedy line, some audience participation, and an overall atmosphere of fun. He always likes to have a little fun with the people, but only picking on people can take it. Kind of like his heroes of the Rat Pack and Rickles days. It's a career that Vallis eased into, after many dues-paying years with Legends of Rock and Roll. He started in that show in 1989, when 16, playing the part of Buddy Holly. (feels he’s getting to "old" for the part as he is nearing 30 - Holly was only 22 when he died). Vallis started doing other artists in 1998, even when on tour with Legends during the soundcheck, he would do Jagger for fun. There was some ambition involved in his branching out as well as the structure of the Legends show, as Holly he always be the opening act no matter how long he was with the show or how good the act became. Not only did Johnny turn into the main attraction but now other people open for him. Holly was not Vallis' first venture into impersonations, he started out as one of the youngest Elvis Presley impersonators in the business. Born in Toronto, Ontario (he says that he had nothing to do with that) his first professional performance was when he 11, at an Elvis night at a Mexican restaurant there. He was still impersonating Elvis after he moved to B.C., including a stint at Expo 86 which is where he got told to start doing Buddy Holly by Randy Friskie. Ironically, today he is one of the few impersonators who doesn't do Elvis, not as Elvis, anyway. He impersonates an poke fun at the Elvis impersonators, he'd rather leave Elvis alone, he feels that there are many Elvis impersonators out there, and they're alive to fight back. One of his first successful post-Holly impersonation was John Lennon - both the singing and speaking voice. But many others followed including a Willie Nelson-Julio Iglesias duet. Another favourite is Tom Jones. The more the audience is involved the better the show becomes. Johnny takes pride in that his comedy style is playful, tongue-in-cheek tone that reveals his personality and artistry, he is clean and never offends. Johnny Vallis was very flexible and adjusts with short notice, as the agenda timing was out of our control. I am pleased to advise that he was professional, conscientious and put on a great show for our event attendees. He was pleasant to deal with and I would not hesitate to engage him again to entertain at one of our events when the opportunity arises. Johnny connected well with our group. He impersonated a variety of well-known entertainers and had our group "in stitches". Your upbeat, fun interactive performance definitely exceeded my colleagues’ expectations, which proved to be a positive conference opener. Look forward to the opportunity to work with you again. I have personally seen Johnny perform on at least five occasions and in all different venues. He has displayed over and over again a high level of entertainment value. He has proven to be a capable entertainer and a true gentleman. I highly recommend Johnny Vallis to any group. His impersonations, singing and music is everything you would imagine, you will not be disappointed. Some of our guests had seen Johnny perform before and were looking forward to the show; those you hadn’t were surprised by his versatility and professionalism. Many guests came to us afterwards to say how much they had enjoyed the performance. 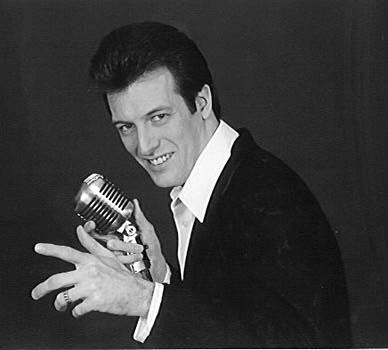 I will invite Johnny Vallis to entertain at other functions given by our Company. 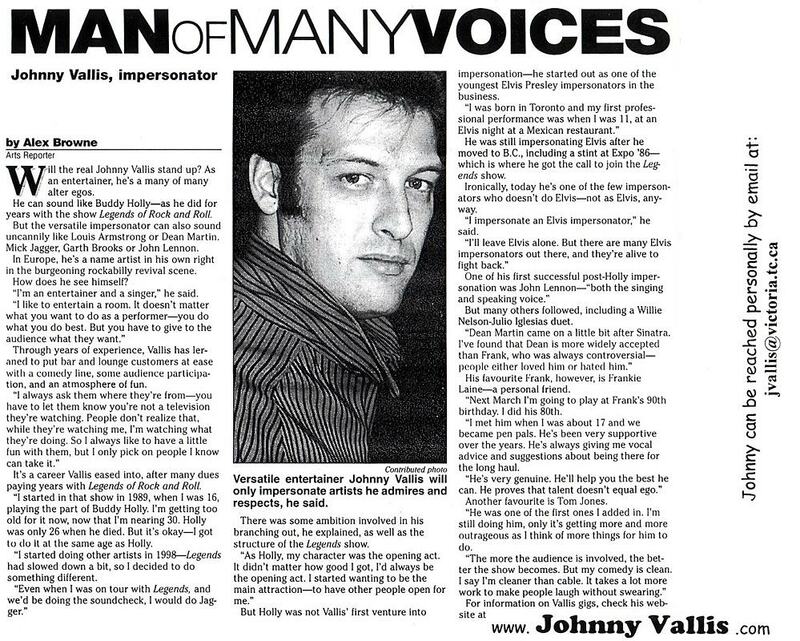 I have the good fortune of knowing Johnny Vallis since he first performed for us as a teenager in 1989 for Children with Disabilities. Since then he has grown into a very versatile entertainer who is able to adapt his performances to any venue whether it be a church hall, department store or nightclub. Johnny can do it all. A professional who takes much pride in his performance and is extremely polite and easy to work with. I highly recommend him to anyone wishing to experience world class entertainment. WEST SHORE - He grew up dreaming of being Elvis, but Johnny Vallis made a name for himself in showbiz by impersonating another rock legend - Buddy Holly. Vallis, spent nine years paying homage to Holly, as part of the three-person (Holly, Elvis and Roy Orbison) Legends of Rock and Roll show. "It was 'the show they never gave,'" said Vallis, who gave up performing as Holly in 1998. Vallis, a View Royal resident since 1992, admits that fate played at least a bit part in his career path, although even as a preschooler, he knew he wanted to be a professional entertainer and musician. "In my Grade 1 annual, it said, 'I want to be Elvis when I grow up,'" Vallis told the News Gazette. "Not I wanted to be 'like' Elvis. I actually wanted to be Elvis. There was never any hesitation that I didn't have the chops." Despite his early interest in music and goal of becoming a performer, Vallis says he isn't entirely sure what sparked that interest. Neither of his parents were especially musical, he said, adding that "there was not a lot of stuff at home, other than Sinatra and Johnny Mathis, which were my early influences." Vallis said he wasn't especially good at sports, and simply gravitated to music from early on. "I just wanted a guitar and wanted to play," he said. "I liked the attention. Anybody who gets into this business, it's because they like the attention." At age 11, in his native Toronto, he earned his first paid gig, a three-song set at a Mexican restaurant. Two years later, as a gangly 13-year-old, he won his first long performance run - a six-month gig impersonating Elvis at Expo 86, in Vancouver. It was there he met another Elvis impersonator - Randy Friskie - who told Vallis he was more suited to Buddy Holly than 'the King,' because of his tall, slender stature. Indeed, Vallis does bear a striking resemblance to Holly, even before he puts on glasses similar to Holly's trademark horn-rimmed specs. Vallis played out his six-month run on False Creek, then moved to Victoria in 1987. He worked on his Holly impersonation, and earned a job playing at a downtown restaurant. It was there that he was "discovered" in January, 1989, and signed to play Buddy Holly with the Legends of Rock and Roll. Ironically, the show's Elvis was none other than Friskie, who had advised Vallis to think about impersonating Holly two years earlier. Just 17 when he joined the show, Vallis spent the next nine years touring throughout North America and all over the world. He cites a 1996 tour of Australia, which involved 66 shows in just over two months, as well as an impromptu performance for the king and queen of Malaysia, as his favourite. Although he never doubted he'd make it in showbiz, Vallis admits his sudden success was a bit of a whirlwind. "Going from Louie, Louie's in January to the Royal Theatre in April was a bit of a G-force test," he said, adding that while he was still a teenager, his co-stars were both stage veterans. "The other guys had been doing this for 15 years," he said. "I didn't even audition for the show. They just signed me and put me on stage." On a serious note, Vallis said it was simply time for a change, time to try something new. As well, he had begun feeling he was ready to be a headliner, whereas with the Legends, Holly was always the opener for Orbison and Elvis. "If you want to stay in a career, you've got to be willing to try something new," Vallis said. His own Man of Many Voices musical comedy show, however, wasn't entirely new. The show involves impressions of Mick Jagger, Louis Armstrong, Dean Martin, Garth Brooks, John Lennon, the Bee Gees and Gordon Lightfoot, among others - voices that were perfected during sound checks for Legends shows. One impersonation he does not do as part of his show is Buddy Holly. "You can't just put the glasses on," he said, "not after what I did for nine years." Neither does he do Elvis, despite his early success impersonating the King. He's one of the few professional impersonators who doesn't do Elvis - he does, however, do impersonations of Elvis impersonators. Vallis's performances also involve a healthy dose of G-rated comedy, but Vallis says his main focus remains on the music. "It's musically based, because my life has been music," he said, going on to describe his act as 'Vegasy type' impersonations. "I'm a singer first and a comedian second - unless you don't like my singing, then I'm a comedian first and a singer second," Vallis quipped. While he plays everything from summer festivals to office parties and conventions, Vallis has also played some big venues. Last winter, he played a warm up show prior to the Grey Cup in Regina (where he met Prime Minster Paul Martin), performed at a benefit concert in Kamloops, after the forest fires ravaged the community. While organizers were hoping for 800 people in the audience, they were overwhelmed with 4,000. More recently, he was in Hollywood in February for another benefit concert, performing with actor/singer Tommy Sands, Donnie Brooks and Glen Glenn among others. Getting to meet and occasionally perform with big name celebrities has been a perk of his career choice, says Vallis. He's had opportunities to meet an array of entertainers, from Mel Torme to Ronnie Hawkins, Frankie Laine to Randy Bachman. It's not just the celebrities he meets, however, that impress Vallis. "That's the fun part, the people you meet," he said. "Whether they're stars or ordinary people." 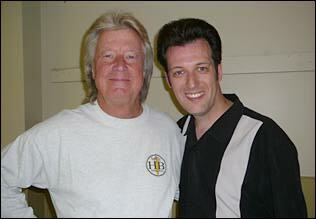 Johnny with Dean Torrence of 'Jan and Dean' fame "Surf City." 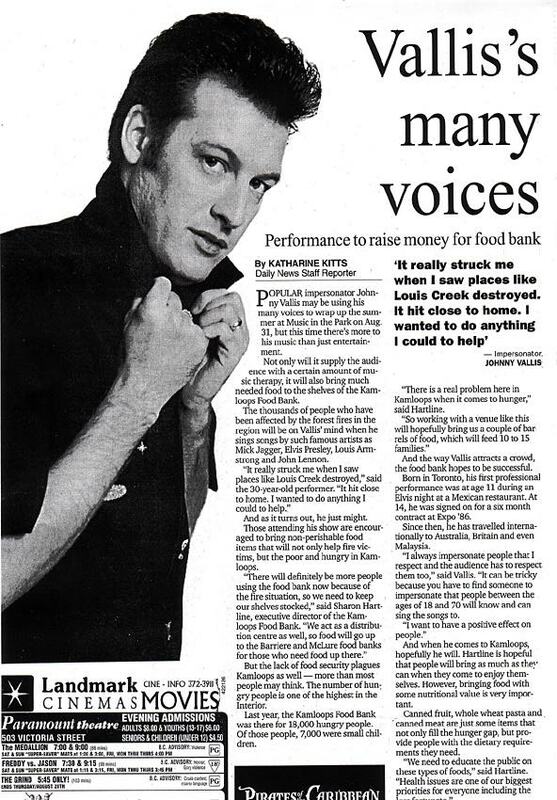 Johnny performed a 5 day event in Regina, SK where he performed 11 shows. Here is a photo of Johnny with Lou Gramm (Lead Singer of 'Foreigner'). "Lou was great to meet, he is a real down-to-earth guy. He still has a powerhouse voice." Vallis said. Frankie Laine has been a special part of my life. A great source of inspiration to me, someone I'll always look up to. As an entertainer he was like no one else from that era. He drew an audience in, made you feel like he was performing just to you. Personally he took time for people, never 'too big' and was always supportive. Gave of his time and energy to Charity. @ 7lbs and 13 oz. Mom and Dad are thrilled! Now that's something to sing about! Be sure to join the mailing list for 2008 dates! 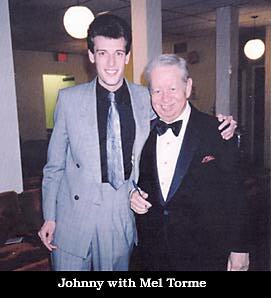 It was a thrill to meet Mel Tormé. Regardless of what style you perform as a singer you can learn from him. 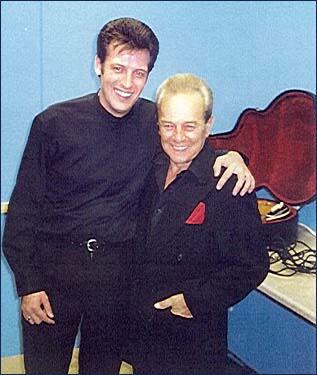 We had written letters back and forth prior and when he performed in town he invited me backstage to visit. To find out about upcoming shows and updates on Johnny Vallis be sure and subscribe to the official mailing list. Just type your email address in the box below. Special thanks to Linda C. use of her photos. Many thanks to Edie at Summit Entertainment. This site is dedicated in loving memory of Johnny's Grandmother, Lilian Rose Storey.